What a sweet idea…gather great talent from music groups of the 60’s, 70’s and 80’s and form a band to bring back some of the most undeniably best music of that era…and they did! 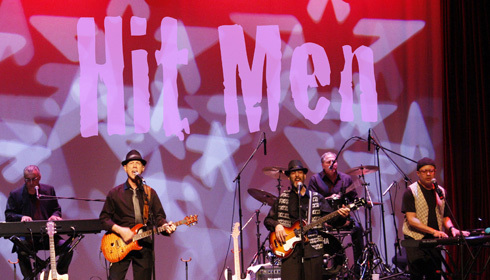 A living history of sorts, The Hit Men are a composite of groups we loved: Frankie Valli and The Four Seasons, Tommy James and The Shondells, The Critters, Carly Simon, Jim Croce, Cat Stevens, Barry Manilow, Elton John and Kiki Dee. They’ve played in these groups; they have forged friendship spanning 50 years. We rocked to the music they made. And they’re ready to bring back those memories for us. Dust off those vocal chords and rock out for the evening to what have now become American standards… “Oh What A Night”, Who Loves You”, “Sherry”, “Big Girls Don’t Cry” are just a few of the Four Seasons hits you will hear, along with “Peace Train”, “Crocodile Rock”, “Mony Mony”, and “Leroy Brown”. Along with the wonderful music of that time, the group will reminisce with stories of what it was like during their touring days and in recording sessions. Purchase Tickets: Tickets may be purchased at the Hershey Theatre website via ticketmaster.